Today, one of our student workers showed me a little-known feature with the iPhone. If you hold down the squarish “Home” button and press the power button, the iPhone will take a screenshot of your current screen. 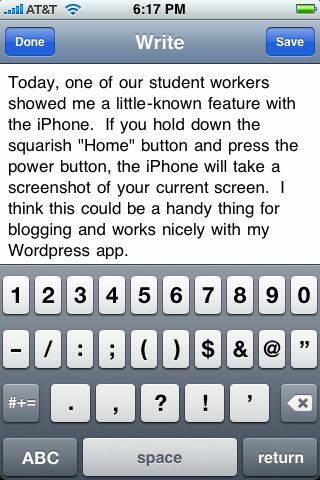 I think this could be a handy thing for blogging and works nicely with my WordPress app. At school I think that I’m going to bring Mr. Computer Man back to life, by inserting some new characters on the scene. That’s Ma’ Board up at the top. Did I ever tell anyone that I love Adobe Illustrator? I just think it’s impressive that I quite possibly made a motherboard look cute and cudley. I think the power supply is going to have dreds and the DVD Writer will be sticking his tongue out.